The mysterious town of Pietralunga. Our first year that we had our house in Umbria, we had a guidebook for the area that described our neighboring town as ‘the mysterious town of Pietralunga’, so now, whenever we speak of Pietralunga it is referred to as ‘themysterioustownofPietralunga’. It is set way back in the Carpini valley and has a remote sort of feeling to it. ThemysterioustownofPietralunga also has an exceptionally good potato and truffle festival. The town is known for a white potato, which has a low water content, thereby making the flavor more concentrated and also making it a very good potato for gnocchi. We took a drive over on Friday afternoon as they were setting up the festa. It was a beautiful fall afternoon, and the road to themysterioustownofPietralunga is this gorgeous, switchback filled road that is perfect for a little convertible. We’re hoping to get back there this afternoon when the festa is in full swing. 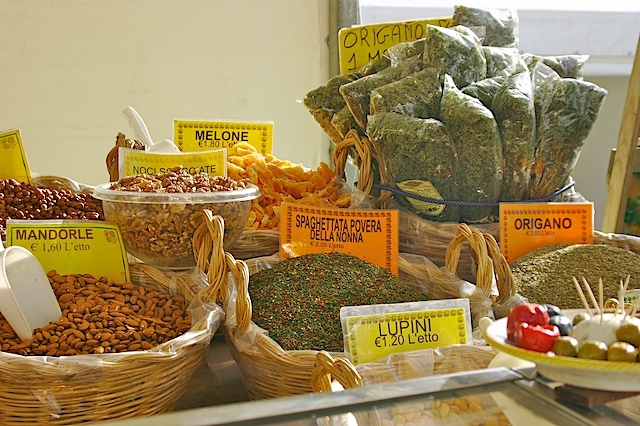 There was a merchant stand open that was selling dried fruit, nuts, olives, capers and other treats. 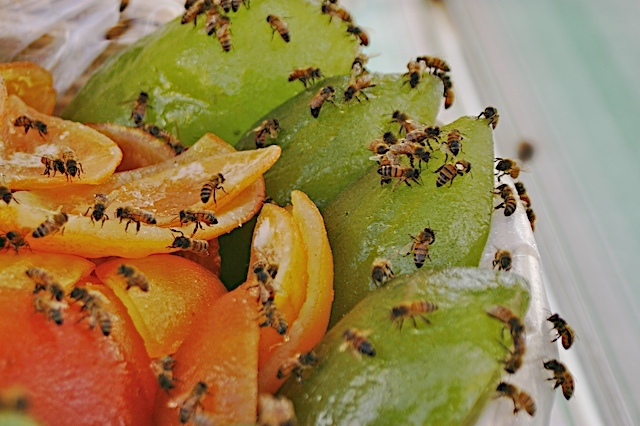 The bees were just loving the candied papaya; although there were other candied fruits, it was only the papaya that attracted them. Now, before you get all twitchy about dirty little bee feet on your fruit, do you think the honeybees wash their feet every day before they make your honey? And take a look at the sack of dried spices “Spaghetti Povera della Nonna”, or the ‘poor grandmother’s spaghetti’. Nostalgia for a grandmothers cooking, and a simpler time is just as prevalent here as it is anywhere else. It seems to be universal, that yearning to turn back the clock to a ‘simpler’ time.